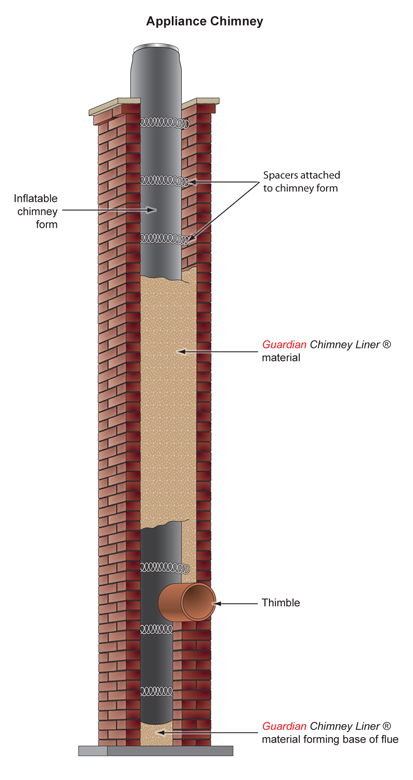 The revolutionary Guardian Chimney Liner® is the safest and most effective way of relining masonry chimneys. Using the “cast-in-place” technique, the Guardian system actually eliminates the need to tear down and rebuild an existing chimney, resulting in substantial savings. Poured into place within an existing chimney, the Guardian mixture hardens to form an extremely durable seal between hot flue gases and the masonry walls. The Guardian Chimney Liner® is designed to withstand extremely high temperatures without cracking or breaking down. It is an excellent insulator against excessive and dangerous heat transfer from the chimney to the surrounding structure. In fact, test results prove that the Guardian system is a better insulator than any other kind of flue liner of its kind. This system also retards the absorption of condensation and the buildup of dangerous and flammable creosote within the chimney flue. As the Guardian mixture is poured into place, it fills in all cracks, crevices, and pores in the existing flue area. This tight, virtually perfect seal helps prevent the leakage of any toxic flue gases into the living area. This seal also fills and reinforces brick joints in the chimney structure, locking them into place and strengthening the entire chimney. Additionally, this lining material is highly resistant to damage caused by the natural “freeze-thaw” cycle which is responsible for much of the damage to highways, bridges, and similar structures. In fact, laboratory tests revealed no evidence of surface deterioration when subjected to these extremes. The Guardian Chimney Liner® is ideal for use with almost every form of heating appliance, whether it burns wood, coal, gas, or oil. The liner is poured to precise specifications so that the actual finished flue is properly sized for the individual heating appliance. 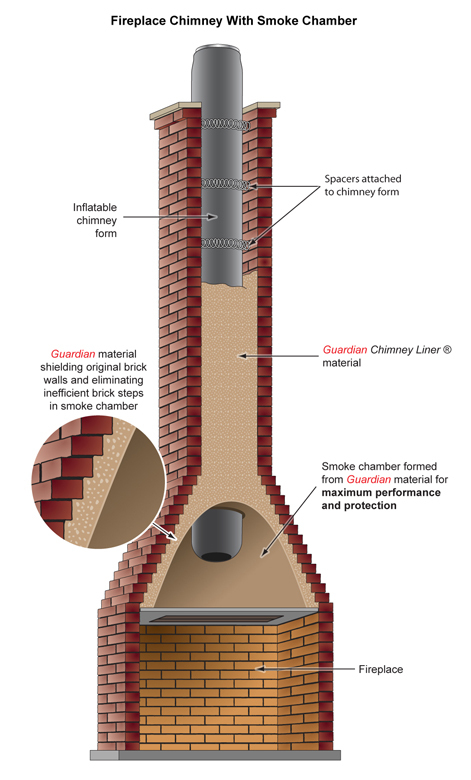 A Guardian liner makes your chimney safer, more efficient, and extremely resistant to corrosion and deterioration. You simply cannot buy anything better to safeguard your chimney. The Guardian System also allows you to safely create two or more flues within one large chimney space, eliminating the need to vent two heating appliances into the same flue. The chimney is first inspected and cleaned using standard chimney sweep procedures and equipment.The chimney is first inspected and cleaned using standard chimney sweep procedures and equipment. Chimneys that have suffered fire damage often have cracked or broken tiles, similar to those at right. All lower openings in the chimney structure are closed off and any weak areas in the chimney are braced.All lower openings in the chimney structure are closed off and any weak areas in the chimney are braced. All of the existing tiles are then removed from the chimney, ensuring a large cavity in which to size and pour the new liner. Next, an inflatable rubber former is inserted into the chimney cavity, centered with spacers to ensure proper flue wall thickness, even along offsets or bends within the flue path. Next, an inflatable rubber former is inserted into the chimney cavity, centered with spacers to ensure proper flue wall thickness, even along offsets or bends within the flue path. The Guardian mixture is prepared on site by simply adding water.The Guardian mixture is prepared on site by simply adding water. The mixture is then poured into the chimney from the top so that it flows around the form, between it and the chimney wall, filling the entire cavity. When the Guardian mixture hardens, the former is deflated and removed, leaving a smooth, round, efficient flue passage.When the Guardian mixture hardens, the former is deflated and removed, leaving a smooth, round, efficient flue passage. The new Guardian liner even shields the walls of the chimney’s smoke chamber. With proper maintenance, your Guardian Chimney Liner® will provide many years of service.Finally, the top of the chimney is finished off with a crown. With proper maintenance, your Guardian Chimney Liner® will provide many years of service.